The stretch of the Capitol Corridor route between Martinez and Davis is one of the prettiest, and just looking out the window it’s easy to see that nature is alive and well here. Most passengers never experience this first-hand though as they zip past the Suisun/Fairfield station on the way to Davis and Sacramento to the east, or Bay Area destinations to the west. 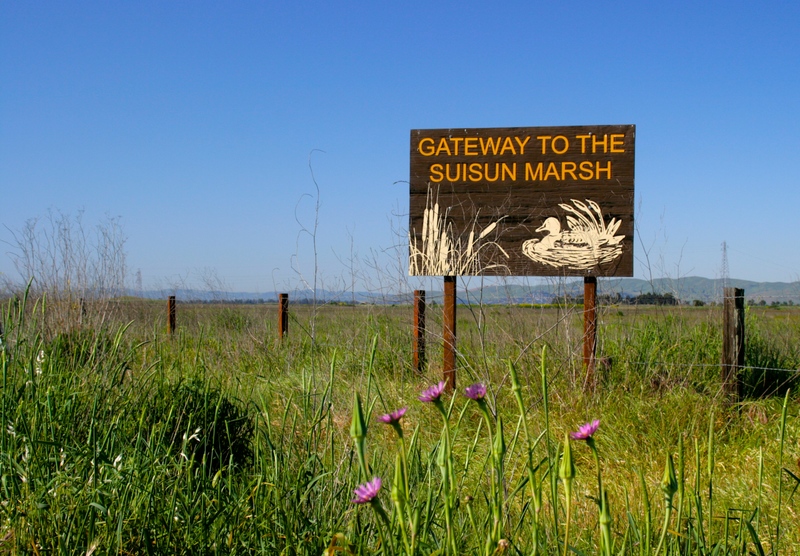 Few people realize that Suisun City is situated by the largest contiguous estuarine marsh in the United States. Abundant with wildlife, and especially birds, the Suisun Marsh is comprised of nearly 100,000 acres of land, bays, and sloughs. 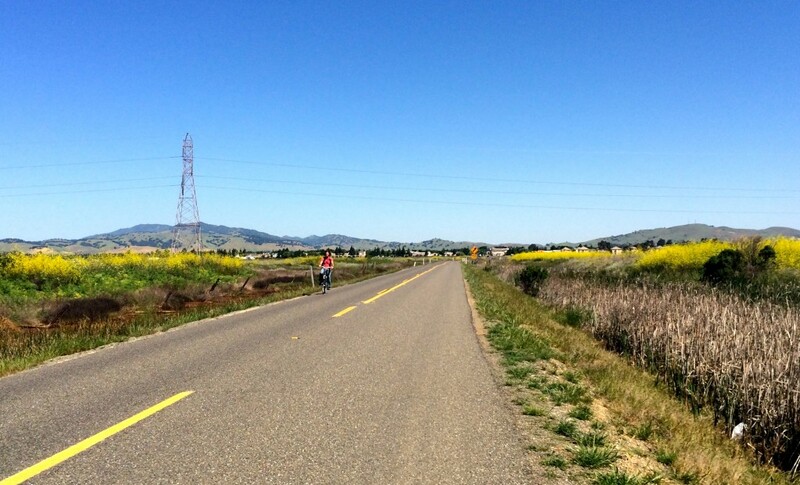 With a bicycle and sense of adventure, anyone can take the train to Suisun and explore this unique and protected habitat. Biking along Grizzly Island Rd., which intersects the Grizzly Island Trail bike/pedestrian path. The Suisun City Amtrak station is just a stone’s throw from a new bicycle/pedestrian path called the Grizzly Island Trail, opened in May 2013. As you exit the station, you can catch the Central County Bikeway to the left of the parking lot towards Route 12. Follow that path half a mile until you reach Marina Blvd. and then cross Route 12 at the light to access the Grizzly Island Trail, marked by an attractive granite monument that’s impossible to miss. 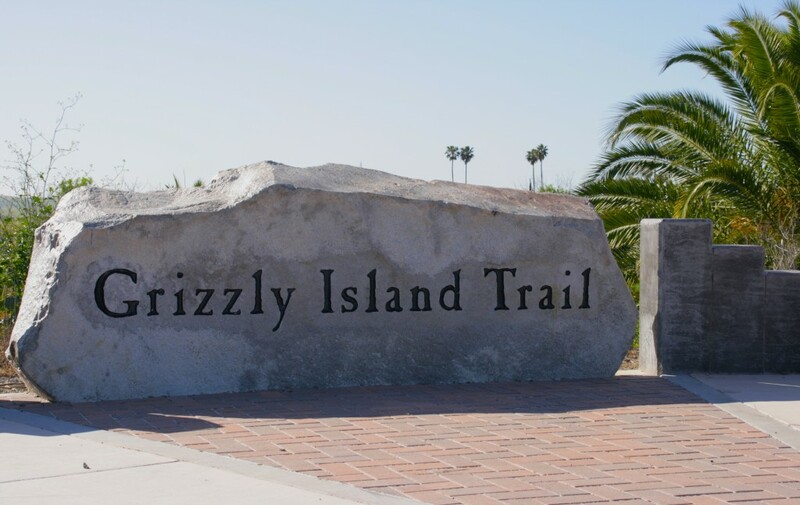 The Grizzly Island Trail monument at the corner of Marina Blvd. and Rte 12. The Grizzly Island Trail is only about a mile long, but is wide and provides plenty of opportunity for recreation – bicycling, walking, jogging, birding, nature study, wildlife observation, and photography. 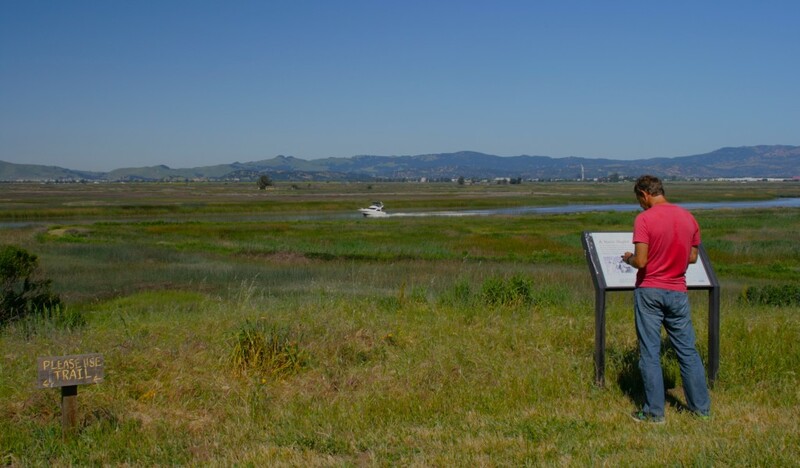 Featuring educational interpretive signs, an overlook area, and benches, the trail skirts the edge of the Suisun Marsh. Heading left as you face the granite monument, the trail leads to Grizzly Island Rd. Take a right on Grizzly Island Rd. to venture into the marsh, which is home to over 200 species of birds, including the graceful snowy egret, the dramatic red-winged blackbird, and stately mallard ducks. In and around the marsh, you’ll observe flocks of starlings swarming in mesmerizing unison, their sing-song projected in full surround-sound. 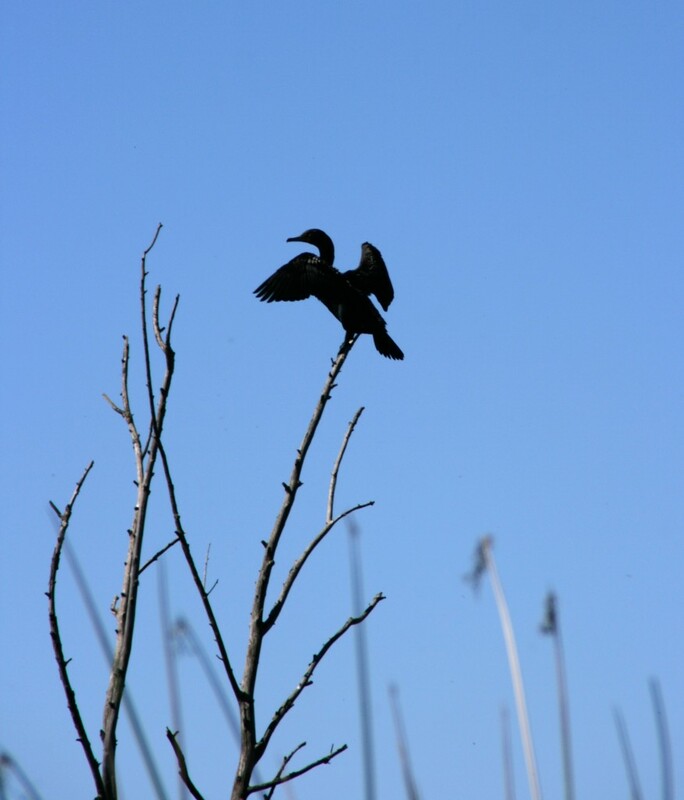 The Suisun Marsh is a haven for over 200 species of birds. Grizzly Island Rd. is a vehicle-access road; however, there’s not a lot of traffic, so it’s relatively safe and easy for bicycling. About two and half miles down the road, which includes a modest-grade hill at the end, you’ll come to Rush Ranch, an operating cattle ranch that is owned and operated by the Solano Land Trust. It is open to the public from 8 a.m. to 6 p.m. The office and education center at Rush Ranch. 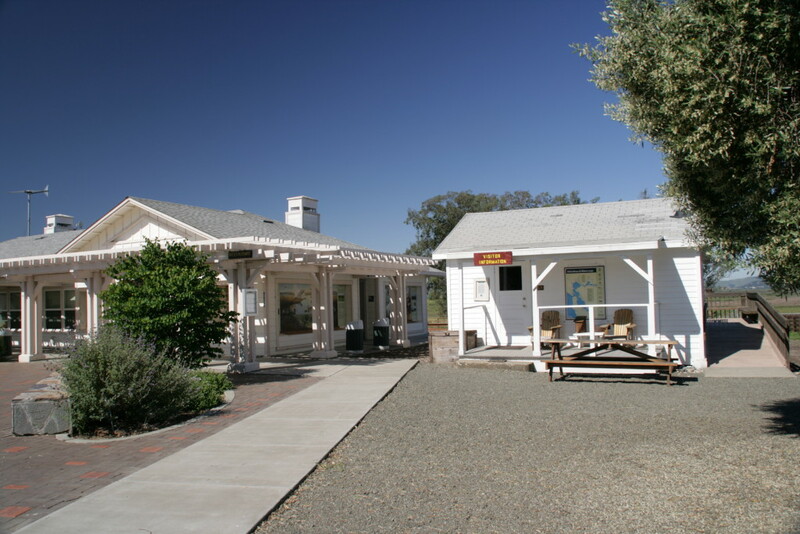 Rush Ranch is a delta gem, with a small, but well-maintained education center and two hiking loops – the South Pasture Trail and the Marsh Trail. Both trails are relatively flat and just over two miles long, providing an opportunity to experience the unique sights and sounds of the marsh. Hiking along the Marsh Trail at Rush Ranch. By the time you get back to Suisun City (you’ll see signs along the Grizzly Island Trail), you’ll probably have worked up an appetite. Head to the Suisun Waterfront District, where you can enjoy lunch on the water at Bab’s Diner or the Athenian Grill, followed by a stroll or bike ride along the pleasant waterfront path. 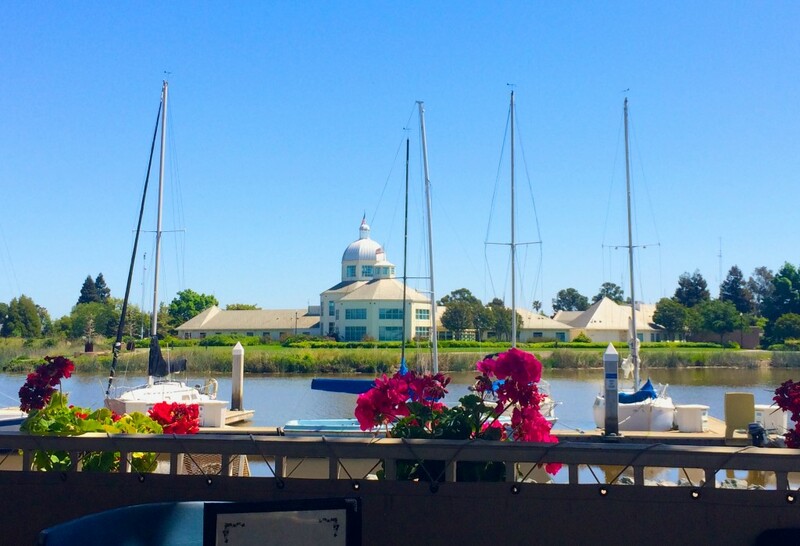 Lunch alfresco at the Suisun waterfront. If you follow this path for about half a mile, you can pay a visit to the volunteer-run Suisun Wildlife Center, a small red house across from the scenic boat launch. Open daily from 9 a.m. to 6 p.m., the wildlife center is dedicated to the rescue of native California wildlife and to the preservation of the Suisun Marsh. There are some resident animals — like Kaiu, a coyote who’s been there since he was struck by a car when he was two months old — who will never be able to transition to their natural habitats. The majority, however, are rehabilitated and released back into the wild. 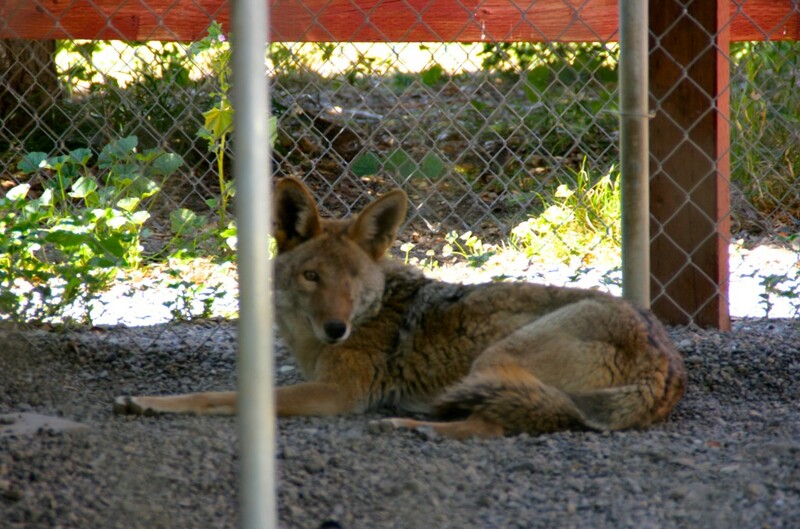 Kaiu, the resident coyote at the Suisun Wildlife Center. 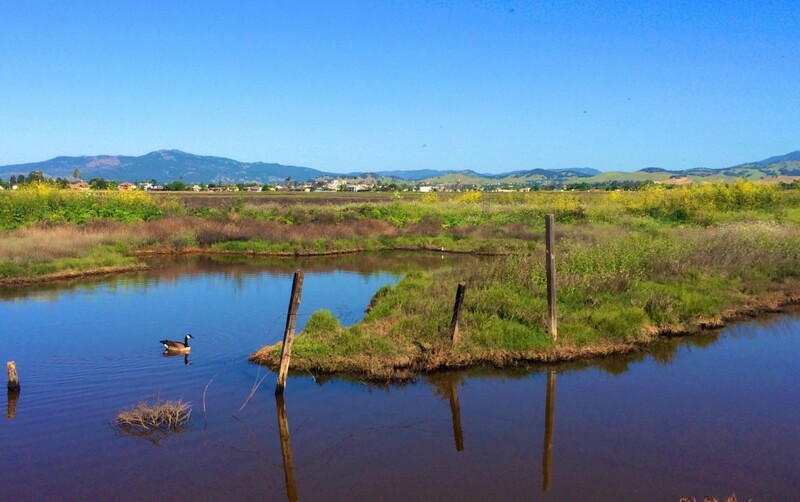 Visiting the wildlife center doesn’t take long, and is a wonderful way to cap off your Suisun Marsh adventure by train and experience first hand the great outdoors. The fastest way back to the station is via Kellogg and Main streets, a little less than a mile away. If you’ve got some time before boarding the train, you might check out the It’s-It ice cream outlet store, which is right next to the station on Spring St.